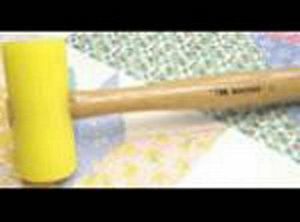 Harvest House Quilting HHQ1001 The Seam Wacker Seams Perfect Mallet Hammer, Steam - Wack - Press and Done! The Wacker seams perfect controls and compresses those unruly mult-layer seam allowances without compromising the small 1/4 seam allowance; no more pressing seams open no more removing stitches to twist and no more clipping into seams just steam- wack- press and done! Harvest House Quilting is owned and operated by Colleen Plucinski, with the constant support of her husband, John, who has assisted in selecting and carrying more bolts of fabric over the years than most could imagine; and John cuts more than 95% of the fabric for shoppers, kits and bundles. Now we just need to get him on our long-arm machine, Sally... we're still working on it! Colleen has had a love of fabric and sewing which started with clothing construction and then home decor. Clothing construction began as a kid. In the early 1970’s a quilt for Colleen and John’s baby daughter, Maurene, turned her interest to quilting. With little available in the way of classes or books Colleen dabbled with self-teaching and much trial and error before she was hooked. Pattern ideas come from inspirations of all types, buildings, landscape, and sometimes a catchy name will “pop” into her head and then the design follows – whatever moves her. Colleen's special tool, "The Wacker seams perfect" tm, is a great tool for flattening multi-seam layers without clipping, removing stitches, twisting or pressing seams open. Over the years we have been honored with it being written up in quilt magazines; being sold through great names such as Nancy's Notions; and appearing in two books published by Susan Cleveland of Pieces be with You, being distributed through 3 major distributors to quilt and sewing shops (Checker Dist., Brewer Sewing and United Notions.) What an honor to be the one blessed with the creation of this wonderful tool! Harvest House Quilting’s mission is to produce original designs with easily understandable instructions - simple instructions for simply great quilt projects. Top quality fabrics and select notions are important in any quilt project and will are available through HHQ. Quilt samples and kit preparations are handled by Colleen, John and several great quilters, Judy, Kathy, Suzy and Mary, who we could not do without. Colleen has belonged to several quilt guilds in the area over the years as there is always something new to learn from the gifted members of each guild. Colleen has started small quilt groups through the years and has been blessed making many treasured friends as a result of quilting, fabric and sewing. Colleen and John also started a charity,"Quilts of Comforts", out of the needs for quilts and comfort back when hurricane Katrina hit the south..... and over ten years later we still provide quilts and pillowcases to victims of natural disasters in the U.S. We are humbled to be able bring quilts and pillowcases to those in such need after hurricanes, tornados, floods, fires, etc. We are blessed to have wonderful and giving ladies assist with the quilt construction. The need never ends, therefore we are always looking for sewers, cutters, and donations to keep us going! Prayers are always welcome!! Many new pattern designs are in the works, with many more waiting in the wings….. so keep a watch on the web site for new offerings and special items. Thank you for your interest in Harvest House Quilting, we wish you many happy hours of quilting and we look forward to serving you. The original and ONLY Wacker seams perfect! 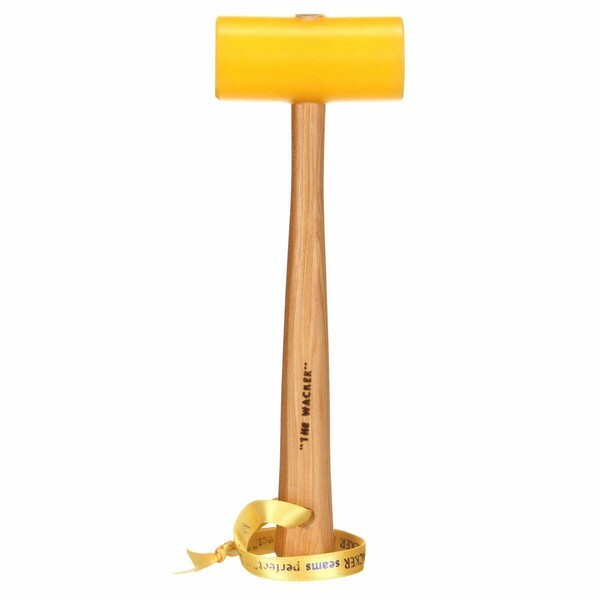 size handle 7-7/8in Lonng, head 3in long x 1-1/4in diameter weights 4 oz Made in the USA!